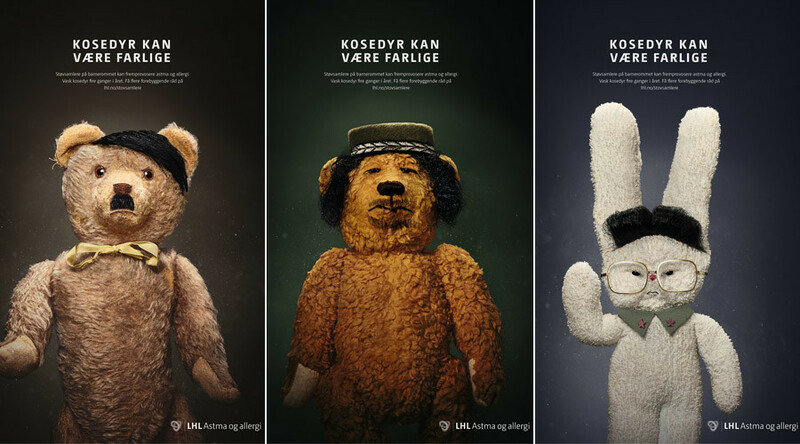 The Norwegian Heart and Lung Association are toying with the image of teddy bears as safe and cuddly with a new ad campaign centered on ‘teddy dictators’. The extreme measures are being used to get the message across that teddy bears can pose a threat to children’s health as they collect dust. The ads feature individual pictures and videos of the teddy bear dictators - Adolf Hitler, Muammar Gaddafi, and Kim Jong-il, along with the tagline “Teddy bears can be dangerous”. Gir du barna en trygg start på livet?Gå inn på www.lhl.no/stovsamlere for å lære mer om hvordan du gjør barnerommet tryggere. Sover barnet ditt trygt?Gå inn på https://www.lhl.no/stovsamlere for å lære mer om hvordan du gjør barnerommet tryggere. Har du et trygt barnerom?Gå inn på www.lhl.no/stovsamlere for å lære mer om hvordan du gjør barnerommet tryggere. The Norwegian Heart and Lung Association has established a special unit, LHL Asthma and Allergy, to focus on the growing number of children with asthma and allergies. The figure has increased four-fold since the 1970s, with more than 20 percent of children affected today, according to The Local. LHL Asthma and Allergy teamed up with advertising firm Kitchen to launch the controversial campaign. The ads focus on the environment of children’s bedrooms in an effort to prevent the early development of asthma and protect against allergies. "For children, stuffed animals can be just as dangerous as the world's worst despots," Kitchen copywriter Bendik Romstad told The Local. One of the campaign’s main aims was to bring LHL Asthma and Allergy into the public spotlight and get people talking - a task they have definitely achieved. Many of the comments on the LHL Asthma and Allergy Facebook page say the ads are too extreme and are a tasteless publicity stunt. The organization has been quick to defend the ads and insisted they didn’t set out to offend anyone, but wanted to use “powerful agents” to get their message across. Replying to the messages, the group said their aim was to make people aware of the explosion of asthma and allergies cases in children over the last 10-15 years. They’ve also pointed out - after receiving queries - that the “Teddy Bears are unfortunately specially for the campaign and not for sale”. The leader of the Norwegian Jewish society “Det Mosaiske Trossamfund”, Ervin Kohn, told Norwegian publication Dagbladet that portraying Hitler as a teddy bear threatens to soften the Nazi leader’s image. “Hitler was a mass murderer and he doesn’t deserve this kind of attention, I’m worried that Hitler can be made to seem less dangerous when he’s used in such a way,” Kohn explained. Of course, controversial ad campaigns are 10-a-penny, with advertising executives competing to push the boat out to shock the audience. Here are some other recent ‘shock’ ad campaigns that got people talking.